If you’ve ever dreamt about catching a salmon or sea trout in Ireland and wondered how to turn your dream into reality then the answer is at your finger tips. 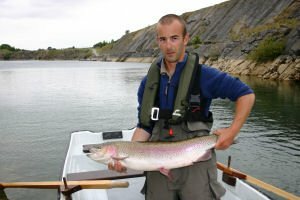 Open Season: Salmon and Sea Trout: 1 February to 12 Ocotber; brown trout: 15 February to 30 September. The River Blackwater season is extended from 1st -12th October on a catch and release basis using artifical fly only). This large and broad river has a lot of fine salmon fishing spread among many private and club fisheries which are all easily accessible. Spring run improving in recent years. The best grilse fishing is towards the end of the season. The Munster Blackwater rises in Co. Kerry and flows for over 100 miles through Cos. Cork and Waterford to the tide at Cappoquin. It is Ireland’s fourth-longest river and is noted for its big run of salmon. The average size of the brown trout is rather small. Spinning and fly fishing for salmon are the methods allowed on all fisheries, but on some fisheries the use of a worm or shrimp is allowed. There is a statutory size limit of 7 inches for salmon and trout, and gaffs are not permitted. No fishing is allowed from the Mill Dam at Clondulane or for 30 yards below it. Ballyvolane Fishery Jeremy Green, Ballyvolane House, Castlelyons, Co. Cork. Fox's Fishery at Killavullen Dan O'Donovan, Craigside, Blackrock, Cork. Longueville House Fishery Mallow, Co. Cork. Ballymaquirke Fishery & Lodge James Murphy-O'Connor, Greybrook House, Waterfall, Co.Cork. Ballyhass Lakes consist of two lakes stocked with rainbow and brown trout. The lakes are fed by springs through limestone rosck and thewater is crystal clear. There is a pletiful supply of natural feed that produces healthy active trout.Once introduced to the lakes, yhe fish feed onlyfrom yhe fly and insect life and there is evidence that theyare breeding successfully in these clear waters. The lakes have been stocked for over five years but have been lightly fished so there are some very largerainbows and good size browns. We operate a catch and release policy to preserve stock. The main lake is FLY ONLY and can be fished from the banks but is best fished by boat. The water is 8m to 11 m deep in most places with very clear visibility. Experienced anglers will be challenged to seek the larger fish from thesedepyh while the lake is ideal for those new to the art of flyfishing. Fly rods can be hired and our resident ghillie is availableto tutor and assist visitors to the lakes. Boats, with life jackets, suitablefor up to two to three anglers can bereserved and hired. The upper lake can be fished from the bank with fly, worm or spinners. The main lake is 12 acres and the upper lake is 2.5 acres. Our facilities include ample car parking, rod hire, toilets, bar-b-que areas, rain shelters, tackle shop. Bait, tea, coffe and light snacks are available. © 2018. Ashfield Cottage. All right reserved.